In the cold reaches of space millions of kilometers from Earth, a ten-year journey is coming to an end and an era of discovery is about to begin. Rosetta, a spacecraft built and launched by the ESA has finally reached its target, meeting up with the comet 67P/Curyumov-Gerasimenko somewhere between the orbits of Mars and Jupiter. We don’t have any vehicles powerful enough to launch Rosetta into the same orbit as the comet, so it’s been a long and lonely trip for the little craft, slingshoting its way around the solar system to make the trip. “After ten years, five months and four days travelling towards our destination, looping around the Sun five times and clocking up 6.4 billion kilometers, we are delighted to finally announce ‘we are here'”, said Jean-Jacques Dordain, the director general of the ESA. Rosetta’s mission is to study the comet up close, to find out what it’s made of and how it changes as it goes around the sun. As I explained in an earlier post, comets are some of the oldest objects in the Solar System, so learning more about them will help us understand the early history of our neighbourhood. Comets may have seeded the planets of our solar system with water and organic molecules, and this mission will provide a wealth of information about the physical and chemical processes in these ancient objects. Rosetta went into hibernation for the last leg of its journey to conserve power. It awoke on schedule in January and pinged to control room back on Earth, to the great relief of the researchers. Since May, it’s made a series of ten rendezvous manuevers to adjust its speed and trajectory to match the comet’s. Now that it’s closer to the comet, it’s started collecting data and sending back pictures. Using its OSIRIS camera, Rosetta recorded changes in the brightness of the comet’s coma — its envelope of gas and dust — in April and June. It also used the MIRO instrument to observe that the comet was losing water vapour into space at a rate of around 300 milliliters per second (that’s roughly a soda can per second, or a ton of water an hour). It also measured the comet’s temperature, roughly -70ºC. At the moment, Rosetta is around 100km from the comet’s surface, but the plan is to get closer still. Over the coming weeks, the spacecraft will make its way to 50km from the surface before settling into a circular orbit 30km out. Rosetta will keep observing the comet throughout, studying it with its bevy of 11 instruments and scanning the surface for a docking site for the lander, Philae. 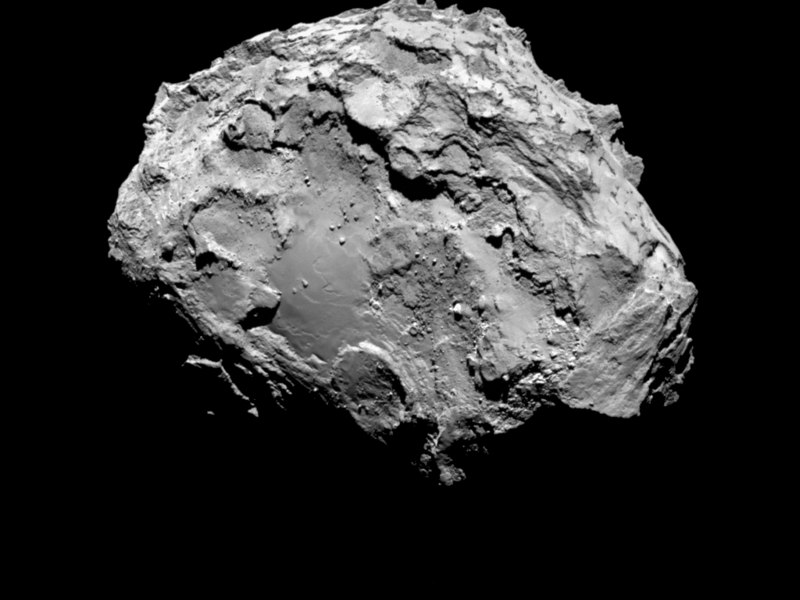 Philae is expected to land on the surface of the comet in November and study it more closely. Nobody knows how long Philae will survive on the comet, so it’s programmed to make the most important measurements in the first couple of days, though hopefully it will be able to keep providing data as the comet gets closer and closer to the Sun. Whatever happens to Philae, Rosetta will stay with the comet for over a year, accompanying it as it swings around the sun and heads back out towards Jupiter. “Arriving at the comet is really only just the beginning of an even bigger adventure, with greater challenges still to come as we learn how to operate in this uncharted environment, start to orbit, and, eventually, land,” said Sylvain Lodiot, ESA’s Rosetta spacecraft operations manager. This is a massive achievement for the European Space Agency and all the individual countries involved. Yes, it’s a fantastic achievement, and hopefully an inspiration for coming generations. Congratulations to all! Yes, I saw this yesterday and it truly is amazing. Unfortunately, I envision all these little mines popping up all over the solar system. I think we’re still far from having the technology to make mining water (or other resources) out of comets (or asteroids) a feasible proposition. Having said that, I think comet-mining is a far preferable alternative to the water wars which are looming in humanity’s near future (and have already started in some areas). Thanks, pip! I’m really pleased to hear that.